Ajapsandali (Georgian: აჯაფსანდალი) is a Georgian vegetarian dish popular as a family meal. 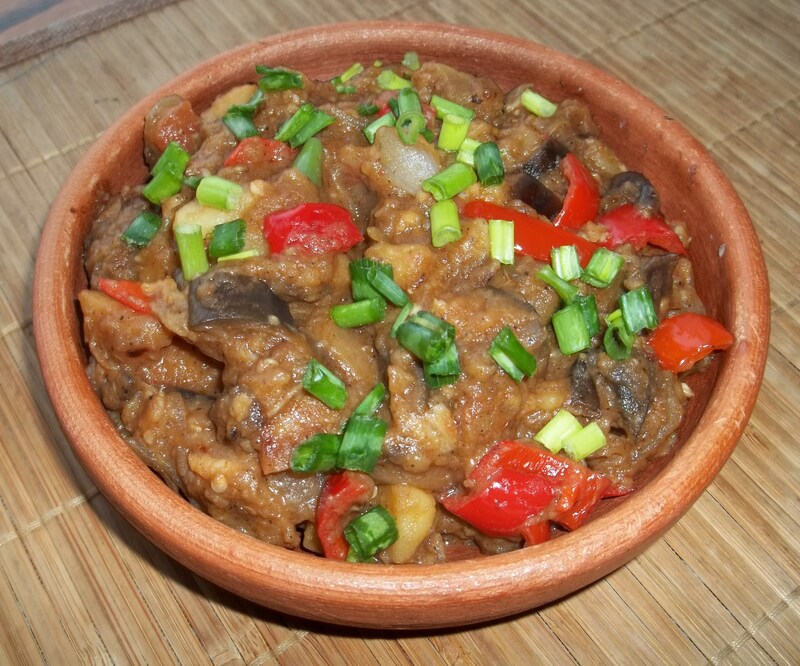 Ingredients (for 5 servings): 500 grams of potatoes, 600 grams of eggplant (aubergine), 2 large tomatoes, 1 tablespoon of tomato puree, 2 large white onions, 3 green onions, 3 bay leaves, 2 green peppers, 2 red sweet peppers, 3 cloves of garlic, pinch of dry coriander, pinch of red ground pepper, pinch of black ground pepper, a pinch of salt and 50 grams of oil. 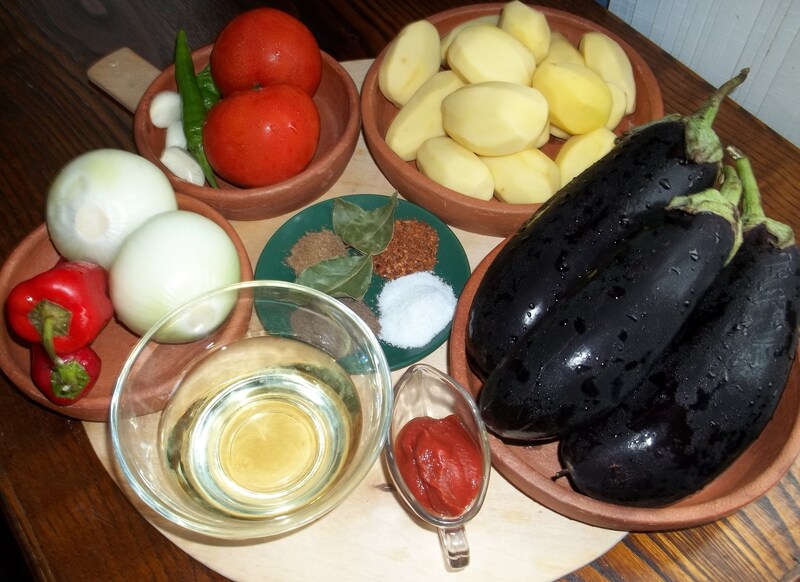 Preparation: Remove skin from the tomatoes, peel potatoes and chop all vegetables as shown in the photograph below. Add 3 tablespoons of water to the tomato puree and mix. 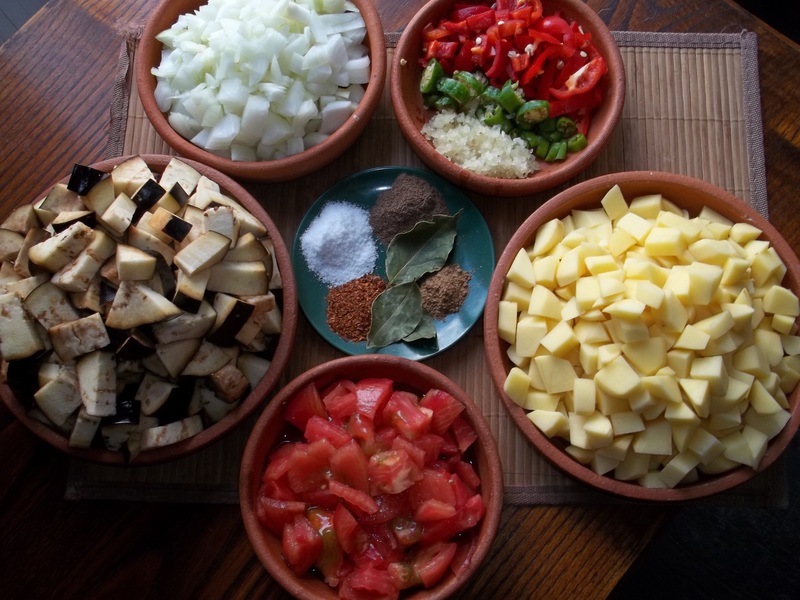 Put the chopped potatoes, chopped onion, chopped eggplant and 3 bay leaves into a large pan and then add oil. Putting oil in last helps to ensure coverage. Cover the pan and cook on a medium heat, stirring several times until the vegetables become soft. Remove the lid, add chopped tomatoes and tomato puree. Stir and re-cover. After 3 minutes add the chopped green and red peppers, garlic, coriander, red and black pepper and salt. Stir, re-cover and cook for a further 5 minutes. 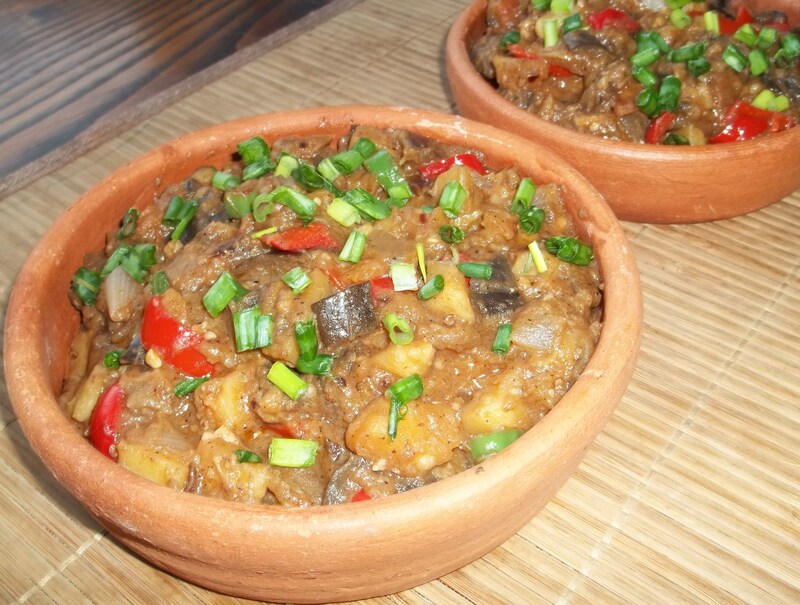 Serving: Add garnish of chopped green onions and enjoy your delicious Ajapsandali!